ROCKVILLE, Md., Jan. 24, 2019 /PRNewswire/ -- Choice Hotels International, Inc. (NYSE: CHH) signed an agreement with CHECO Purchase Company, LLC, a subsidiary of Concord Hospitality, which has newly formed Common Oaks Lodging LLC, to develop 27 new WoodSpring Suites hotels. The hotels will be built throughout Michigan and North Carolina, as well as in the metropolitan areas of Jacksonville, Fla. and Nashville, Tenn.
"We are so pleased to have this opportunity to help grow the WoodSpring Suites brand and – through Common Oaks Lodging – expand upon our existing relationship with Concord Hospitality. We believe the markets on which we are focused are ideal for WoodSpring Suites and fill a significant gap in this segment of the lodging industry," said Paul Novak, Managing Director for Whitman Peterson. 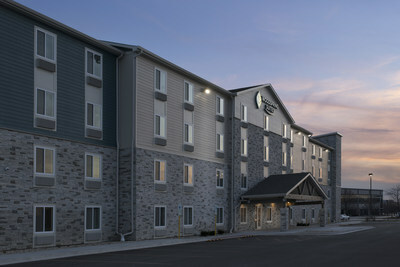 To learn more about WoodSpring Suites, visit www.woodspring.com/ourbrand/. WoodSpring Suites hotels offer extended stay guests a welcoming environment and straightforward stay – all affordably priced. Franchised by Choice Hotels, WoodSpring Suites is the nation's fastest-growing economy extended stay hotel brand. Each property is newly-constructed and built to anticipate the needs of travelers looking for a longer-term stay. Properties feature all-suite rooms with fully-equipped kitchens, flexible workspaces, and guest laundry facilities. There are more than 240 WoodSpring Suites hotels open in over 35 states and nearly 100 in the pipeline across the country as of September 30, 2018. For more information, visit www.woodspring.com/ourbrand/. Common Oaks Lodging LLC is a subsidiary of Concord Hospitality Enterprises Company. As an award-winning hotel development and management company, Concord Hospitality Enterprises Company has spent the last three decades building relationships with investors, partners and hotel owners developing and/or managing premium-branded properties with a value in excess of $2.5 billion across the United States and Canada. As an operator, Concord Hospitality instills value from the ground up, developing and managing with a sustainable viewpoint, maintain a focus on quality and hands-on involvement to ensure long-term profitability and success. Learn more at www.concordhotels.com. Whitman Peterson ("WP") is an institutionally backed real estate investment management company actively investing in the hospitality, multifamily, student and seniors housing sectors. Through its discretionary commingled funds, WP has invested in transactions involving more than 150 acquisition and development assets, with an aggregate capitalization of over $15 billion. Whitman Peterson focuses on helping drive significant asset and operating company growth to a select group of prominent national operating, investment, and development companies within WP's target sectors. To learn more about Whitman Peterson, visit www.WhitmanPeterson.com.